Almost four years on from the 2014 military coup in Thailand, the junta continues to repress fundamental freedoms. Human rights organisations report that human rights defenders, environmental activists, students, community activists, lawyers, journalists and academics continue to endure a clampdown on their freedom of expression, perpetrated by both the state and the private sector. The governor of Thailand's Chiang Mai province has sued a local magazine for posting on Facebook a "blasphemous" painting of ancient kings wearing pollution masks as part of a campaign to protest the city's hazardous smog. The painting, which was the work of a local high school student, was posted on Citylife Chiang Mai's Facebook page to promote a rally urging authorities to tackle a toxic haze that plagues the northern city annually. The province's governor called the artwork a "blasphemous act" and directed an official to file charges against the outlet under Thailand's Computer Crime Act. The cyber-crime law, which carries up to five years in prison for uploading false content to the web, is routinely used against perceived critics of the monarchy on social media. This is the second time the station has been suspended this year, following a 15-day closure in February for criticising military rule. Peace TV is linked to the United Front for Democracy against Dictatorship (UDD), who are supporters of Thaksin Shinawatra, the former Thai prime minister ousted in a 2006 bloodless coup. The UDD suspects the NBTC decision is linked with concerns over protest activities timed to coincide with the four-year anniversary of the coup on 22nd May. A British labour-rights activist who helped expose abuse in multiple food industries in Thailand has been ordered to pay THB 10,000,000 (USD 321,000 by the Prakanong Court in Bangkok, Thailand. Andy Hall was ordered to pay the damages after Finnwatch – a Finnish non-governmental organization – published a report exposing rights violations at National Fruit Co Ltd. Hall was named in the case after he conducted research for the report, and was interviewed by media organisations about his findings. The report detailed National Fruit’s mistreatment of workers, which allegedly included violence, child labor, forced overtime, and the confiscation of passports. The civil damages relate specifically to an interview Hall gave to Al Jazeera English in Myanmar in April 2013. Natural Fruit filed multiple cases against Hall, under both the criminal and civil defamation provisions in Thailand’s criminal code, including allegations under the country’s Computer Crimes Act, because the interview was published online. The decision is the result of nearly five years of court battles and multiple appeals. The court had dismissed the civil case, citing a lack of jurisdiction to try the case since Hall was in Myanmar when the interview – and allegedly defamatory comments – occurred. However, an appeal by Natural Fruit to the Appeals Court ordered the Prakanong Court to accept jurisdiction and hear the case in full in August 2017. The Thai court’s decision to order damages has been strongly condemned by the International Labor Rights Forum (ILRF). ILRF Executive Director Judy Gerhart said. On 23rd February 2018, soldiers arrested Aiman Hadeng, chair of the Justice for Peace Network and a prominent ethnic Malay Muslim human rights activist, from his house in Yala province’s Muang district during a security raid. Holding him under the 1914 Martial Law Act, the military prohibited Aiman from calling his lawyer, confiscated his mobile phone, and detained him at the 12th Task Force Camp. He was later transferred to the 41st Taharn Pran Paramilitary Division for further interrogation, allegedly for involvement in the separatist insurgency. According to Human Rights Watch the enforcement of the Martial Law Act in Thailand’s southern border provinces has long raised concerns that the rights of detainees are not respected. This draconian law provides military authorities with legal immunity and broad powers to detain individuals without charge in informal places of detention. Military authorities have often delayed providing information on detainees and their whereabouts, heightening concerns about enforced disappearance and mistreatment. Since January 2004, a violent armed conflict has taken place in Thailand’s southern border provinces of Pattani, Yala, and Narathiwat. Thai magazine editor Somyot Pruksakasemsuk was released from prison yesterday. On 30 th April 2018, Thai magazine editor and pro-democracy activist Somyot Pruksakasemsuk was released from prison after serving a seven-year sentence on lèse-majesté (insulting the monarchy) and defamation charges. Somyot was arrested on 30th April 2011, in connection with two satirical articles in his Voice of Taksin magazine, which Thai authorities considered to defame the late King Bhumibol Adulyadej, even though the Printing Act protects editors from being held accountable for the content of others. Article 112 of the Penal Code (the lèse majesté law), prohibits any word or act which “defames, insults, or threatens the King, the Queen, the Heir-apparent, or the Regent” and carries up to 15 years of imprisonment for each offence. In 2012, the United Nations Working Group on Arbitrary Detention (WGAD) found that Somyot’s detention was arbitrary and that he should be released. Since the May 2014 military coup, Thailand’s junta has tightened the chokehold on freedom of expression in the name of protecting the monarchy. According to Human Rights Watch the junta has arrested at least 105 people on lèse majesté charges, mostly for posting or sharing critical commentary online about the monarchy. Some of those charged for critical Facebook posts have been sentenced to decades in prison. On 3rd May 2018, hundreds of protesters gathered outside the United Nations’ regional headquarters in Bangkok and two other locations to urge Thailand’s military government to end what they say is the intimidation of community activists by authorities. The demonstration was one of the largest displays of displeasure against the Thai junta in recent months. It was organised by the People’s Movement for Just Society, or P-Move, a network that represents farmers, the urban poor and indigenous people who have been forced from their land. 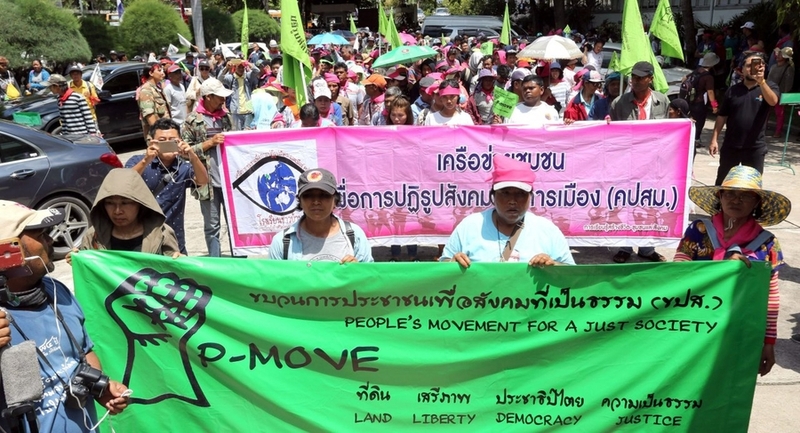 On 13th May, P-Move activists, who have traveled in their hundreds from other provinces to gather in Bangkok, agreed to disperse after coming to an initial agreement with the military government, who promised it would fix land rights issues in different provinces. The protest underscores growing public disgruntlement ahead of a general election that the military government has repeatedly delayed. Most recently, the date has been set for 2019. Over one thousand people gathered in the northern Thai city of Chiang Mai on 29th April to protest against the building of a government luxury housing project on forested land, in one of the largest demonstrations held thus far under military rule. Ariel images of the housing project for judges, circulated on social media over the past few months, showed construction has carved into the forested foothills of Chiang Mai’s Doi Suthep mountain, inciting public anger. Protesters, many wearing green ribbons, demanded the government demolish the new buildings that encroach into Doi Suthep mountain, saying the government must comply in seven days or face more protests. The gathering was one of the largest since Thailand’s junta took power following a 2014 coup. The junta imposed a ban on public gatherings of over five people and has largely curbed freedom of expression through various orders and used military and police force to block public gatherings.